The little ones (and not so little ones) can't get enough of the curly slide and splashers at the onsite water park. Pro tip: the onsite restaurants deliver out here. Cobblestone streets give you the sense you're somewhere more Mediterranean than Caribbean. The bright fitness room inspires. Host a viewing party on your balcony, or head to the beach and lie on the sand. Dark wood accents offer a stunning contrast to the predominantly white palette. Located on a gorgeous white sand beach. Your kids will love the waterpark, trampoline and sand play area. Enjoy a refreshing beverage at the poolside bar. Whitewashed buildings along narrow cobblestone streets give Miranda Bayahibe - All Inclusive a distinctly European flavor, while the sparkling turquoise water reminds you that you just so happen to be at one of the southeastern coast’s most spectacular beaches. Reserve a day bed on the palm-dotted beach while the rest of your crew rounds up teams for soccer or volleyball. At some point, when you make your way to one of the pools – don’t miss the Wet Bar, a relaxing hydromassage area. The elaborate splash park right at the village entrance enchants the little ones with its curly slide, tower and squirting sea creatures. (Good luck waving them over for sunscreen. Snack break may be a smarter strategy.) When you start getting peppered with, “What’s for lunch?” questions, order from the main restaurant or pizzeria – they both deliver to the pool or pier out over the water. Head back to your spacious two-bedroom suite for a late afternoon snooze or a date with your book out on the balcony. Later, grab a table at the Ocean Grill if you prefer to leave dinner to the pros, then head back to your suite to get the tuckered ones tucked in. (That stroll through the neighboring fishing village can wait for another night.) Plot the rest of the week’s adventures early on, so you don’t miss your chance to go kayaking, parasailing or snorkeling/diving through the undersea museum. Please note: The waterpark is open 2:00 PM-5:00 PM Monday, Wednesday, and Friday; 11:00 AM-1:00 PM and 3:00 PM-5:00 PM Saturday and Sunday; closed Tuesday and Thursday. Schedule is subject to change without notice. Please note reservation modifications and no-shows may be subject to a fee. If cancelled or modified up to 4 days prior to arrival, no fee will be charged. Cancellations or modifications 3 days prior to arrival will be charged the cost of 1 night’s stay. The full cost of stay will be charged for cancellations or modifications within 2 days of the arrival date or in the case of no-shows. For more details, please contact the office using the information on the reservation confirmation received after booking. 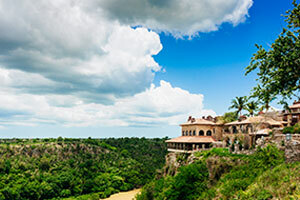 Located on the Caribbean Coast, La Romana is the seventh-largest city in the Dominican Republic. Founded in 1897 as an oil town, the city shifted to sugar production in 1917. It is best known as the shooting location Francis Ford Coppola's "Apocalypse Now" and "Rambo" starring Sylvester Stallone.